Released late 2009 in Europe, Novarama’s inviZimals went on to win various technological awards on its way to be becoming one of the top 3 selling PSP titles in all of Europe last year. 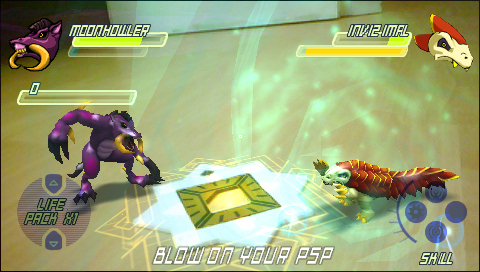 Making use of ‘augmented reality’, the game comes bundled with Sony’s long-delayed PSP camera, which allowed the inviZimals to ‘invade’ the real world. Almost a year later, InviZimals has arrived in North America. Is this the second coming of Pokemon or a failed attempt that is too little, too late? The first time you fire up inviZimals, get ready for some of the cheesiest live-action cut-scenes this side of the Super Mario Bros. Show from the early 90’s. You’re introduced to Kenichi Nakamura researcher for PSP R & D in Japan, who just so happens to speak fluent English. He explains to you that during his late night studies, he discovered something amazing: there are creatures hiding in plain sight, but you and I can’t see them. These creatures are called inviZimals and it just so happens to be that you can capture and trade them. There is only one problem though… The only way you can see them is with your PSP and PSP Camera (included with the game). Along the way you’ll meet Professor Dawson and of course, seeing as how they is always an evil adversary, Kaminsky who wants to steal the inviZimal technology. Oh noes! Ok, so the storyline isn’t going to win any awards anytime soon, but it’s good fun that children of all ages will enjoy. Older gamers should get a kick out of it too as it brings more cheese than Velveta. 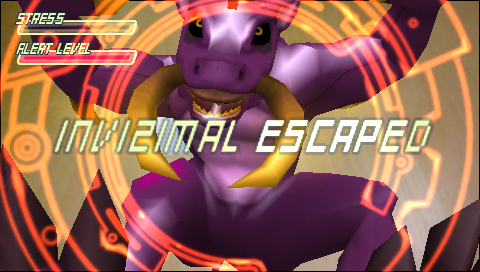 Your quest is to ‘capture’ all 123 inviZimals during the course of the game, which is surprisingly a blast to do. Using the PSP camera which is bundled with the game, your job is to scan the environment, looking for the creatures, and then figuring out the correct way to add them your collection. I honestly enjoyed having to run around my house, listening to the scanner chirp louder and louder until I found one. When you discover an inviZimal, you must quickly slap down the magic card, as several different icons appear on-screen. To successfully lure it out of hiding, you must align each icon until they become one. Once the inviZimal comes to life, then its on! Some require to simply slap the creature to capture it. Others demand that you move around in a circle, staying behind it, slowly sapping its energy until it is yours. This is one of the best and most original parts of the game and one that everyone will enjoy. 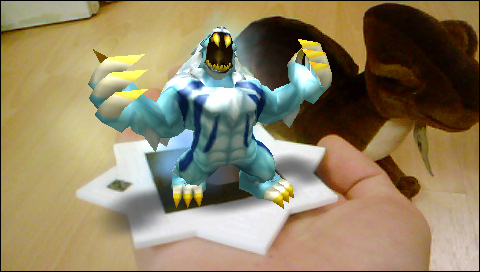 A quick note though, you must keep your magic card in view of the camera, or else the inviZimal will return to its hidden state. The best part about the game is that your kid, which is who you most likely bought this game, is going to love it. Having to search around the house, finding these monsters in their own house is going to blow their mind, since they will never, ever know where it is going to be. So where did I find my first inviZimal? On my chest! Thankfully, once you bring it to life, you can simply place the map card wherever you want, so that you don’t have to figure out how you’re going to tape the magic card to your ceiling. The game’s graphics are as basic as they come, seeing as how the game has to take into account and process your setting and properly project the creatures into it. Some other ‘creature capturing’ games have been praised for their character designs, sadly, inviZimals monsters lack any type of originality or designs that you will remember anytime soon, as most character designs are generic and basic looking. This doesn’t hurt the gameplay in any shape or form, but you won’t be bragging to your friends as to which cool inviZimal you captured. Gameplay is fun, but not too in-depth for the young ones. While this might turn off some older gamers with its simplicity, it makes up for it with the magic powers later on. You’ll choose from your captured inviZimals and have them do battle. Each inviZimal has their strengths and weaknesses. Some might be a powerhouse, yet their stamina might quickly evaporate after each strong attack. Every move you perform depletes your stamina This is when the magic powers come into play and do so quite creatively. Want to use the earthquake attack? Start shaking your PSP up and down. Need to use the wind attack? Breathe into your PSP’s mic! While the gameplay might be simple and shallow, using the magic easily makes up for it. Multiplayer also adds to the fun, as it extends playability and is easy to figure out. Most multiplayer modes out modes can be too complicated for the kids but inviZimals takes into account the demographic and makes it easy for anyone to sign-on and enjoy. It’s sad that such a unique and original game had to the hit the PSP so late in the system’s run. If this game had been released a couple of years back, it would have won many more awards than it already has and would have been noticed by more gamers, because sadly, even though inviZimals is a fantastic game for the PSP, it will sadly be overlooked during the holiday rush of titles that have begun to hit this year. For those of you who are hooked and must get some more inviZimals action in your blood, you’ll be happy to hear that Sony announced a sequel recently at E3 titled Shadow Zone. If you’re looking for a good title to help your kids from always wanting to mess with your $300+ PS3, inviZimals offers them plenty to do and see. Older gamers, though, will enjoy the game until the freshness wears off and the game shallow gameplay rears its ugly head. For $40, which includes the full game and the PSP camera, you certainly get your money’s worth but it wont hold an older gamer’s attention for long. The future is bright for the inviZimal‘s series and if handled properly, could certainly be a secret weapon in Sony’s future software arsenal. + A game that kids of all ages will enjoy. + The PSP camera offers many unique magic effects. – The freshness will quickly wear off for old gamers.